The Obama administration is being accused of stalling a congressional investigation into a purported $1.7 billion taxpayer-funded "ransom payment" to Iran in exchange for the release of several U.S. prisoners, according to documents and information provided to the Washington Free Beacon by sources familiar with the matter. The administration initially came under fire from congressional critics in January, when it was announced that the United States had settled a longstanding legal dispute with Iran over the breakdown in a decades-old arms sale. 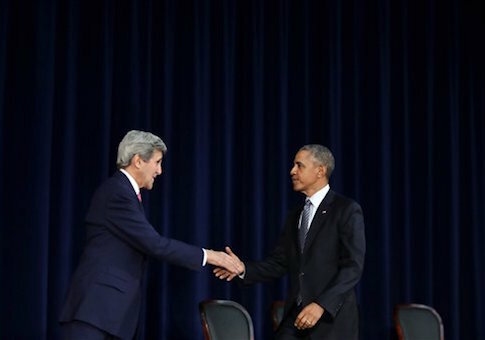 Under the terms of the settlement, Iran was to be paid a $400 million balance and an additional $1.3 billion in interest from a taxpayer fund maintained by the Treasury Department, a State Department official confirmed to the Free Beacon in January. The settlement was reached outside of the recently implemented nuclear deal and is separate from the $150 billion in unfrozen cash assets the United States is obligated to give to Iran under that agreement, the official said. The $1.7 billion payment was announced just prior to the release of five U.S. prisoners who had been held in Iran, leading to accusations that the deal is tantamount to a ransom payment. Iranian officials, at the time, independently described the transaction as a form of ransom. While the Obama administration immediately denied that the two issues were linked, lawmakers remained skeptical and pushed for more answers. Rep. Mike Pompeo (R., Kan.) reached out to Secretary of State John Kerry on Jan. 21 to outline his concerns and request further disclosures about what he called a "ransom payment" to Iran, according to a letter sent by the lawmaker and obtained by the Free Beacon. The State Department has not responded and is said to have ignored multiple follow-up requests from Pompeo’s office, according to sources familiar with the situation. When asked Thursday whether a response is in the works, a State Department official told the Free Beacon, "We take seriously all correspondence from Congress and respond accordingly." The administration’s delay is causing frustration on Capitol Hill and prompting accusations that the State Department is stalling congressional efforts to investigate how the settlement with Iran was reached. "The State Department likes to drag its feet on responding to Congress, particularly on issues related to the Iran nuclear deal," one source familiar with the situation said. "This stonewalling is reminiscent of recent testimony by a senior Department of Homeland Security official who would not answer members’ questions on refugees and visas." "Congress is only trying to do its job of holding President Obama accountable and ensuring taxpayer dollars are spent wisely," the source added. "The Obama administration’s refusal to answer legitimate questions leaves the American people to wonder what they are hiding." In Pompeo’s case, the State Department initially confirmed its receipt of the letter in January but did not provide information as to when officials might respond. The administration subsequently failed to respond to further requests for a response issued over the following months, sources said. Pompeo’s investigation surrounds "the timing and details" of the cash transfer to Iran of $1.7 billion, according to his letter. The administration’s behavior "indicates it might be a ransom payment and it is likely interpreted as such by our adversaries," he wrote. "We may be seeing a dangerous precedent in action as three Americans, reportedly kidnapped by Iranian-backed Shia militias in Baghdad, remain missing." "Many find this timing suspicious," he said. "I fear this payment is the latest incident that is establishing a dangerous precedent that will lead to more Americans being captured abroad." The lawmaker sought further information on "the relationship" between the $1.7 billion settlement and the release of the five American prisoners. He also wants to determine whether the lawsuit was ever discussed in "conversations with the Iranians about the release of American hostages." "Did you secure an assurance from the Iranians that they will not use this $1.7 billion to fund terrorism?" he asked. Pompeo goes on to request details about additional legal claims by Iran, asking: "How much money does Iran assert we still owe them? How many more billions can we expect the Obama administration to hand to the Ayatollah?" Other sources familiar with the matter also chastised the administration for dragging its feet. "This is one of the main ways the Obama administration hides its Iran foreign policy," said one foreign policy consultant who works intimately with Congress on the Iran portfolio. "Sometimes they over-classify information to keep it secret, sometimes they mislead lawmakers about their intentions, but a lot of the time they engage in this kind of sandbagging." "By the time anyone gets any answers, whatever catastrophic policy they were hiding has become the new normal," the source said.